If I am able to reach my stretched target, I will use the money to have a limited run of 100 Vinyl copies of the album printed with anyone who pledged to be offered a copy at a largely reduced price if interested. I am very pleased to have finally finished all work on my third album. It's recorded, mixed and ready to go, it just needs a bit of assistance getting it onto disc! I am not asking for handouts, just encouraging anyone interested in pre-ordering! I have also planned for a limited number of bundles to be made especially, including a double sided t-shirt that will not be re-printed and limited to only 50. 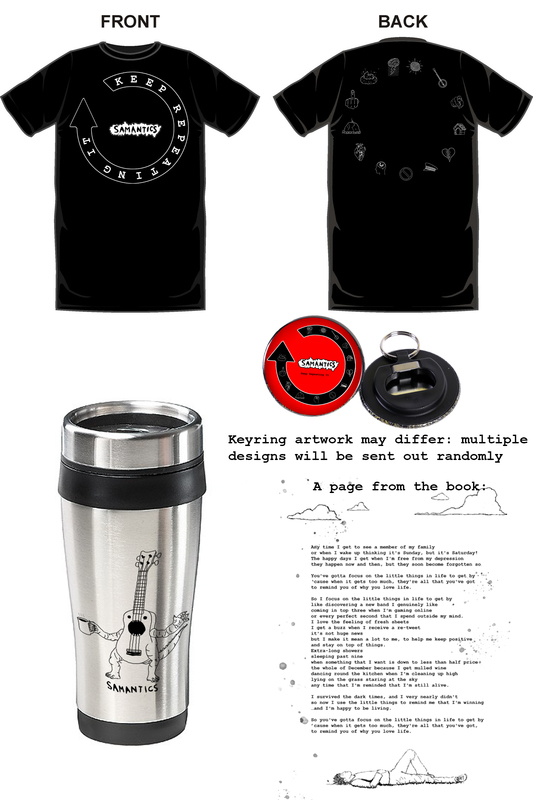 Other bundle delights include a lyric book (with all previous album words included) a bottle opener key-ring and a travel mug, because tea is necessary wherever you may be, plus, no more takeaway cups! There are some pictures below to show some of the rewards available! I am aiming to raise 2000 to cover all costs, so, if 200 wonderful people were to pre-order, that would cover the costs alone! This is an 'All or Nothing' campaign, meaning, if the target is not reached, no money will be taken. If the target is achieved, any money pledged will not be transferred until the campaign has finished. I would be massively grateful to have your support, if you don't like the music, it could make a great gift for someone's nan? STRETCH TARGET - If the stretch target of £3000 is reached, I will be having a limited run of vinyl made, anyone who pledged would be offered a vinyl copy at a greatly reduced price. A copy of the new album. 12" Vinyl - I've Pledged Already! The album, for anyone outside of the UK. Vinyl - I haven't pledged yet! The Super Mega Awesome Bundle of Joy! Containing... A CD, a specially designed lyric book filled with words from all previous Samantics albums (and a few extras). A limited edition, double sided, T-shirt which will not be reprinted after the campaign. A Samantics key-ring bottle opener and a Samantics travel mug - perfect for festival season! See main page for pictures! Send me some information about a topic of your choice - person? pet? favourite cereal? Whatever you want, and i'll turn it into a song to be sent out on a CD or via download. A gig in your front room!